Milford Sound sits within Fiordland National Park in the southwest of New Zealand’s South Island. The park is part of Te Wahipounamu, a UNESCO World Heritage site. 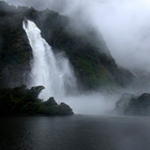 Milford Sound is the jewel of Fiordland National Park – a hidden secret waiting to be discovered. 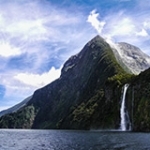 Despite its name, Milford Sound is actually a fiord, not a sound. It is also the only fiord in New Zealand that is accessible by road. 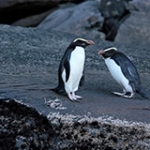 However, its remote location, bounded by steep cliffs and dense rainforest, means its special features remain unspoilt. Rain or shine, Milford Sound continues to captivate even the most experienced traveller with its beautiful surroundings, ink-dark waters, gushing waterfalls and captivating views. 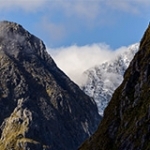 You can visit Milford Sound on a day tour or stay the night. Most Milford Sound tours include cruises but there are a number of other activities on offer, including kayaking and even scuba diving. There are a number of options for getting to Milford Sound, but only one road providing access. Not so surprisingly, it is called the Milford Road and is also known as State Highway 94. Milford Sound can also be visited by air. The story of Milford Sound, from the first Māori explorers to the arrival of European settlers, and how it became a world famous natural attraction. Nestled deep within Fiordland National Park, Milford Sound’s sheer cliffs and rocky valleys were formed by ancient glaciers over hundreds of thousands of years. On a trip to Milford Sound, you might find yourself up close and personal with some of New Zealand’s rarest flora and fauna. Find out where to look and what you’ll see on your tour.